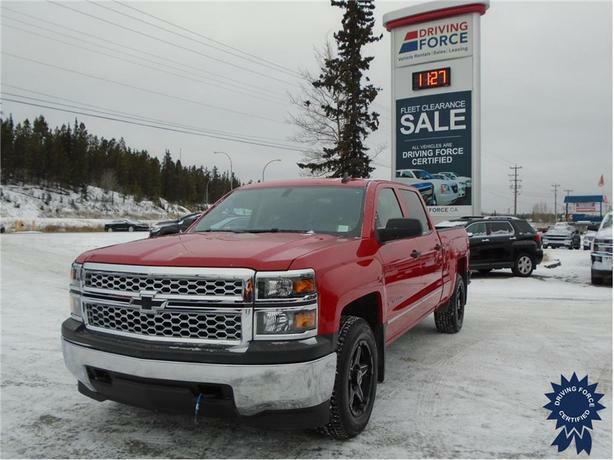 This 2015 Chevrolet Silverado 1500 WT Crew Cab 6 Passenger 4X4 6.5-Foot Medium Box Truck comes with a 153-inch wheelbase, 6-speed automatic electronically controlled transmission, 3.42 rear axle ratio, 17-inch wheels, tow/haul mode, victory red exterior color, 4.2-inch Diagonal Color Display, AM/FM stereo with USB ports, engine block heater, tire pressure monitoring system, 150-amp alternator, and GVWR rating of 7,100 lbs (3,221 kgs). The 4.3-litre EcoTec3 V6 gas engine with Active Fuel Management provides 285 horsepower at 5,300 RPM and 305 lb-ft of torque at 3,900 RPM. Touch base with us to discuss purchasing or financing options that are right for you and experience the difference you will only find at DRIVING FORCE Vehicle Rentals, Sales and Leasing.